The San Juan Islands are known for a vast variety of wildlife. Most people know about the orcas, the humpback and gray whales that are frequenting the waters of the Salish Sea and the foxes and deer seen roaming on land. We also have an impressive array of birds – over 200 species to be exact – to observe and treasure. Some birds stay all year, some stop in on their migration south and some of them come from further up North and spend the winter here with us. 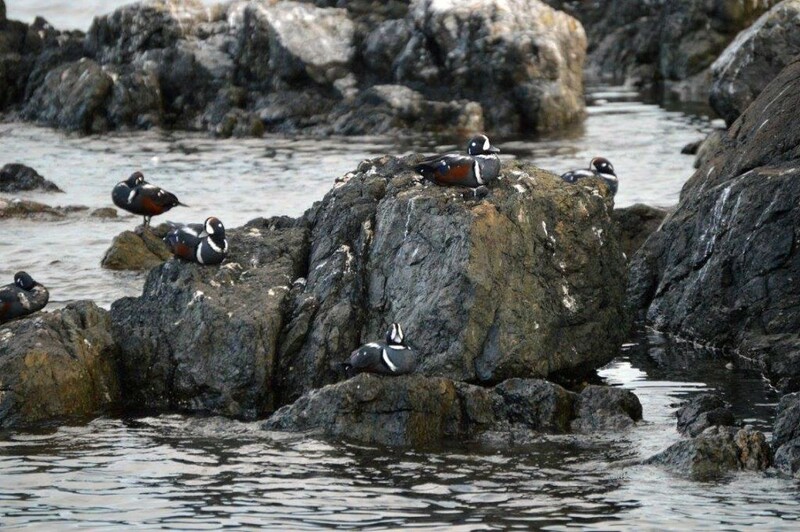 Head down to the South End of San Juan Island any day during winter, where you can observe rafts of Pacific Loons, Common Murres, grebes and an array of colorful ducks (like the Harlequin ducks pictured below). Sit and watch them dive in unison and fly over the waters of Haro Strait. Another prominent visitor is the Trumpeter Swan. Seeing the swans fly over you in their signature V-formation is a sure sign that winter is well on its way. They like to hang out on bigger ponds and lakes, and the fields surrounding them and also set up shop in our seasonal wetlands, flooded by the winter rains. The San Juan Preservation Trust does an annual count of these magnificent white visitors, roughly 90 individuals call our islands home for the winter every year. 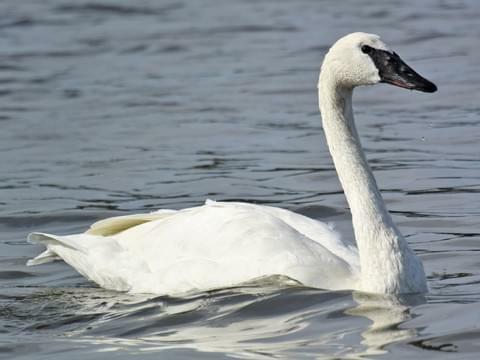 Trumpeter swans were on the brink of extinction in the 1930, with only about 69 individuals left, and have since made a remarkable recovery. They started showing up in the San Juan Islands in the 1970 and have been returning every year since, seeking safe refuge. 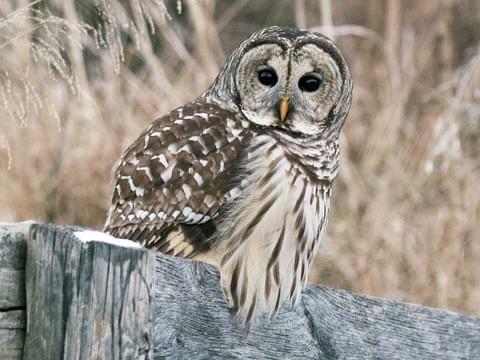 Another bird that has really just recently established itself is the Barred Owl. It has only become a regular visitor to the islands in the early 1990 and can now be found breeding here. It is now very common to hear their “Who cooks for you” calls through the woods. The soaring bald eagle is a magnificent sight to see and we get treated to eagle flights many a times here in the islands. Not surprising as the San Juan Islands have one of the highest densities of breeding bald eagles in the lower 48 states. Over 125 breeding pairs call our islands home. If you pay attention you can often here them chat with each other in the trees with their unique calls, especially in the early morning hours. 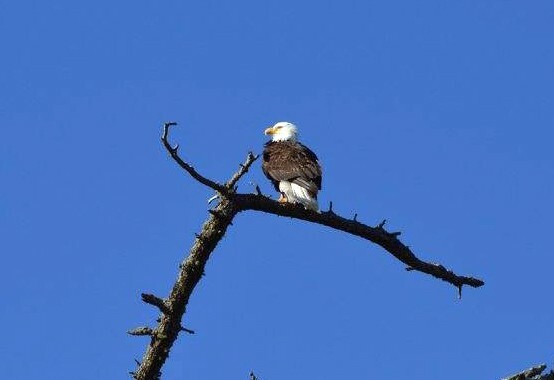 Bald eagles can be observed all year round, but from August to October they can become a rare sighting as many of them will migrate to salmon spawning rivers for a few months. One of my favorite winter visitors is the little Pacific Wren that will come and sit on my porch chair and sing his little heart out. Such a tiny little thing with such a big voice! He will welcome the day like clockwork right around the time I prepare my morning coffee and then says goodbye to the day around the time I start to think about making dinner. 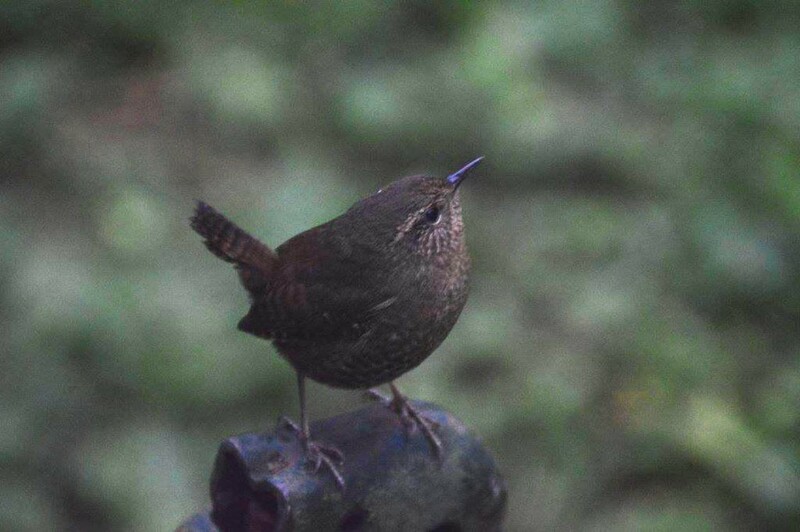 The wren is definitely a favorite little visitor of ours! There is definitely never a shortage of wildlife viewing opportunities here in the San Juan Islands, no matter what season it is, it’s worth a visit!